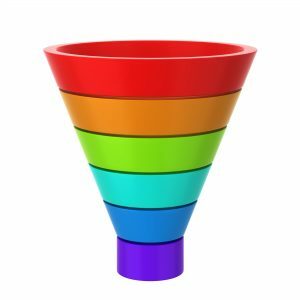 If you want your website to generate sales, ClickFunnels may be the route to go. In this article we talk about what ClickFunnels is and how they can help you. Are you looking to generate leads, sales, and customers for your business online? Creating an online sales funnel can help you build awareness, engage leads, and convert them into paying customers. ClickFunnels is a platform that allows you to build high performing sales funnels with ease. Read on to learn more about this program and how it can help your business! This tool is a landing page building platform. It allows you to create sequential landing pages that traffic flows through. As a drag-and-drop builder, the platform is incredibly easy to use and comes with numerous templates to help new users get started. It also has numerous options for tracking, email marketing integrations, and e-commerce checkout functionality. ClickFunnels price varies based on your needs, starting at $97/month for the basic package and $297/month for the Etison Suite, which includes Actionetics and Backpack. In ClickFunnels, building a marketing sales funnel is as simple as building a website on a platform like Wix or Squarespace. There is zero coding experience necessary. You can include your own images and videos. A basic sales funnel might consist of two landing pages: a signup page and a confirmation page. The flow of a sales funnel is significantly different than that of your normal website. Websites have multiple pages that a user can visit. Leads can often get lost in a cycle of endless browsing and scrolling. An online sales funnel takes users step by step through the process of becoming a customer. For example, many businesses use sales funnels to generate leads. In this case, the first step might be offering potential customers a coupon or discount deal. To receive the deal, customers opt-in on the first page of the funnel with their name and email address. They are then taking to a thank you page, where a business can offer an upsell to generate revenue. This is the basic idea of a sales funnel, but funnels can have many steps with multiple upsells, downsells, or offers. How do people enter a sales funnel that’s built on the platform? In many cases, traffic is funnel comes from paid sources such as Facebook ads or Google Adwords. Paid traffic is currently one of the most cost-effective ways to drive leads into a sales funnel. A sales funnel doesn’t end when leads leave the landing pages. The platform has the ability to integrate with your email marketing platform, such as MailChimp. With these integrations, you can follow up with leads and previous customers using planned email marketing campaigns. Using an email sequence after your sales funnel will allow you to foster repeat business, create new product or service offers, and increase your customer lifetime value. With ClickFunnels, you can create and drive traffic to an online sales funnel in minutes. How do you see sales funnels fitting into your business’s online strategy? Let us know in the comments! Looking for more social media marketing tips? Visit our Facebook blog to get started!